I am a girl who always looks at things and sees how they can be improved. It suits me well in my career as a consultant. I can walk right in a room and easily notice all the things that can be better- there needs to be an outlet cover on that plug, that stack of boxes near the ceiling is a fire code violation, this shelf should be secured for earthquake safety. I can watch a rowdy classroom and immediately see three adjustments a teacher can make to restore peace in minutes. I’m able to skim a document and find typos on the spot. It’s a gift that makes me a good asset for my clients, especially when I can take those observations and help them put together a plan for improvement. I love what I do, especially when I can see people enjoy their work more as they grow toward excellence. [pullquote width=”300″ float=”left”]My fear is that I’ll get so wrapped up in running a race that I don’t even notice I crossed the finish line… and that would be sad and insulting to the God who carried me the whole way. [/pullquote]It’s both a good thing and a bad thing that this ‘gift’ spills over into my personal life. I’m constantly noticing things I’d like to improve- I could have had a better tone of voice when I spoke to my son just now, I’ve not been spending enough time reading the Bible lately, my windows really need to be cleaned. In some cases, this watchful eye is a great motivator, compelling me to speak nicely, wake up earlier, and find someone to clean my windows. It helps me to learn and improve. Other times, though, it causes some problems. Though I want to strive for godliness, when I finally reach a victory, I tend to rush right past it. Recently, I lost 22 pounds. But to tell you the truth, when I stepped on my scale, I didn’t even see those 22 pounds. I saw the 25 that still need to go. When I host an event, the dishes aren’t even put away before I’m mentally making a list of what I want to do differently next time. I barely finish teaching a class, and I’m back to the drawing board making notes about things I want to change in the future. It’s hard for me to reach a healthy level of contentment, especially when I keep seeing ways to do better. The Bible reminds us in 1 Timothy 6:6 that “Godliness with contentment is great gain.” I think maybe Paul means that to be truly rich, we have to find the balance between striving toward godliness and resting in contentment. Yes, we want to strive toward the perfection that Jesus modeled for us, but we also want to be able to be content with the peace that He’s given us as well. For me, that message gives me comfort to know that striving toward perfection is a good thing. Being a perfectionist isn’t sin in itself. It’s good to want to make things better, to do better, to BE better. The sin comes in when we can’t appreciate the beauty of what God has already done, has already given us, has already equipped us to do because we are rushing off to the next thing. One thing that I try to do to improve my contentment (see what I did there?) is take the time to notice and celebrate gifts and accomplishments before I start plotting the next thing. That looks like stopping and celebrating a wedding anniversary with a husband who needs to hear that I’m happy with who he is even more than he needs to hear my helpful tips on how he could be a better husband. It looks like sending a text to a friend who needs to celebrate living a year since her husband left her. It looks like making a special dinner for a child who brought up a grade in a subject they struggled in. It means stopping a client and making them pat themselves on the back for making progress before we look at the next goal. It means doing a mini wave in celebration of the fact that I made my bed every day this week (go, me!). It means celebrating silly holidays and dancing in celebration of the little things. I’ve been working on my M.Ed. for the last year, and by the time you read this, I will be in the final days of the program. Now that I’m getting closer to the target, I’m tempted to sit down and plan out what to do next. I keep wanting to Google doctorate programs, send out resumes, update my LinkedIn Profile. I struggle with wondering what I need to work on next before I’ve even finished with the last thing God told me to do. My fear is that I’ll get so wrapped up in running a race that I don’t even notice I crossed the finish line… and that would be sad and insulting to the God who carried me the whole way. So, instead of hitting “delete” when the information about the graduation ceremony arrived in my inbox, I hesitated for a moment. Do I need to travel out and wear a cap and gown and walk among a bunch of twentysomethings in my orthopedic shoes to validate this achievement? Of course not. Do I have more critical things to do with my time than attend the ceremony? Maybe. But I think that taking the time to celebrate this victory has a few very important benefits. First, it teaches my children that celebrating accomplishments is important. Next, it allows me a chance to let God and the people who supported me to be able to do this see that I appreciate what they provided for me. Finally, it’s a step in the right direction for me toward that goal of godliness with contentment… and that makes me feel extremely rich, indeed. How about you? Do you struggle with contentment? 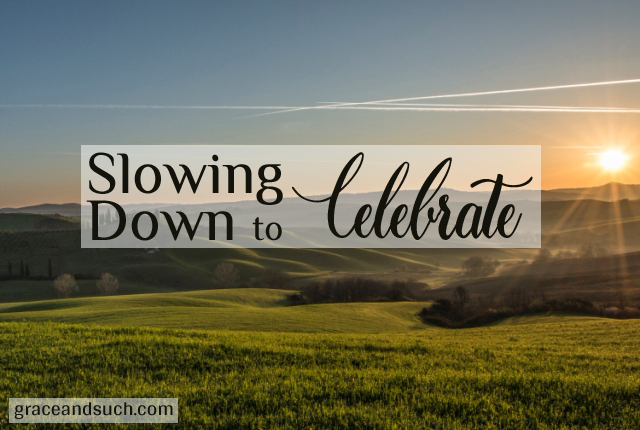 What do you need to celebrate today? I’d love to hear in the comments. “My fear is that I’ll get so wrapped up in running a race that I don’t even notice I crossed the finish line… and that would be sad and insulting to the God who carried me the whole way.” That last part, that he carried you is one of those things I too often take for granted. Gives me pause to consider how he does that on a daily basis, and that I and of itself, is cause for massive celebration! Thanks, Amber! And you should def celebrate this educational milestone! CONGRATS!!! Thanks for celebrating with me, Diane! “I struggle with wondering what I need to work on next before I’ve even finished with the last thing God told me to do.” Such a good reminder! I tend to do this, meanwhile missing the present reality. And I threw a big party for myself when I graduated with my MA- I was a 50 something among mostly men, but it was a great day. Enjoy it! Yay for you, Rebecca! So glad to hear you threw a party- way to celebrate! Ooooh, I’ve been struggling with contentment for years–something I’ve been meaning to write about for a long, long time. It’s hard when other women my age have houses and babies and dogs, and I have…another big move to make, a career to figure out, a husband still in school, and a 1.5 gallon fish tank with two tiny fish and a weird snail. But hey, I’ll only be 25 next month. It’s all good. But contentment is so, so hard at this transitional age, especially with social media. Stupid Facebook! Natalie- I hear you! I think that it’s extra hard to be content when we social media confirms our worst fears- that we are not doing enough, because everyone else is doing it all with no problem. The secret not enough of us are telling is that we’re ALL trying to figure it out, we ALL feel like we’re behind, we ALL struggle with thinking we’re the only ones who don’t have it all down. Purposefully being content is hard, but worth the work. And how great if you can figure out how to be content where you are when you’re so young! Maybe you won’t have to work so hard at it when you’re older (though I think it’s always SOME work- human nature and all that!). Ah, thank you, friend!!! Keep reminding me. I’m a junkie. Heard this! I happen to think that my lack of contentment, and immediate push towards improvements, while feeling the need to gloss over victories (expecting them of myself) comes from waiting for the other shoe to drop when I grew up. I always had to be so good. If I wasn’t, I was told it was my fault when things fell apart. Whatever the things were. So, this is an area that God is working on in me, as well. Not only contentment with each day, but gratitude and celebration for the little things as well as the big things. When I focus on Jesus, there is no other shoe waiting to drop. There is grace. And He’s crazy about me just as I am. My victories are because of Him. Mind-blowing. Thank you for writing this so eloquently, Amb. Oh boy, that other shoe! May we all enjoy the grace instead. Thank you for being a big part of my journey toward this, Gretchen! This is such a great piece, Amber. I love the analysis you can do when you walk into a room. However, I see where that would be a burden in your own home. I also think it’s great that you remember to send texts of celebration and encouragement to your friends. What a blessing that must be. Know what this post reminds me of? That saying: We are human beings, not human doings. Diane- thank you for the encouragement. I love that saying- I think I’ll write it down right this minute. I think it’s kind of a superpower, but it tends to run amok if I’m not careful. Girl you must have been following me around with a hidden camera. I’m always the one with a 5 year plan. Or the one who walks into Target and thinks “well, that’s not very efficient how they have the customer service line organized.” Most days, this is a good trait and some days, I get in my own way. I’m so thankful that God places reminders in front of me to be still, to live in the present moment, to drink it all in. To honor God by striving for excellence while being content with where and who I am. Congratulations on your degree Amber- we celebrate you! Oh, 5 year plans are my FAVORITE! Still working on behaving well when they are just not possible. Here’s to both of us getting out of our own ways, and thank you for celebrating with me!